Sherpa Ant | Northeast mountain-inspired illustration. Card came so quickly and it is great quality. Kerry is AMAZING to work with, and I would recommend her awesome shop to everyone!!! So cute and great quality! Shipped super fast, too! 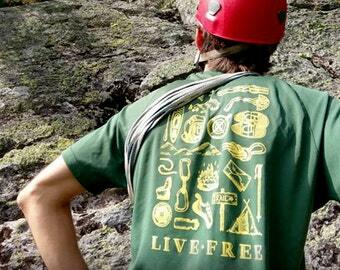 Men's and women's Live Free shirts are now back in stock! New product: Mt. 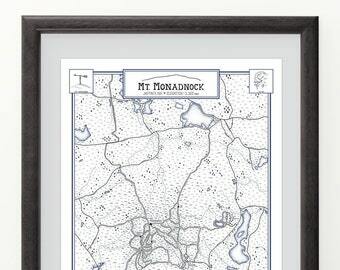 Monadnock hiking trail map! This map features all the hiking trails and water features surrounding one of the most famous mountains in the world. Don't forget Mom. Mother's Day is coming up quick, grab a card to let her know how special she is. Completing the 4,000 footers in New Hampshire on top of Mt. Carrigain. Hello! My name is Kerry and I am the illustrator and creator of Sherpa Ant. I currently live, draw and play in New Hampshire with my fiance, Erich. We recently completed a thru-hike of the Pacific Crest Trail, where we got engaged! 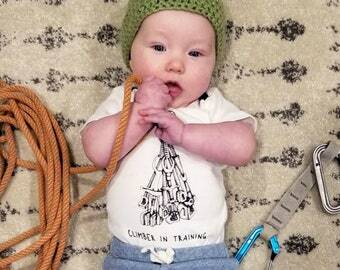 In addition to hiking, we love rock-climbing, skiing, beer, pizza and pups. I grew up hiking in the White Mountains, not only peak-bagging but also discovering the less-traveled trails. When I returned to hiking in the White Mountains after completing my thru-hike of the Appalachian Trail in 2013, I had a vision for an art print that not only looked beautiful on the wall but most importantly helped to discover new trails while easily showing which ones had been hiked. After many sketches and different versions, the "White Mountains Hiking Trail Map" was completed. Sherpa Ant was created in 2016 to merge the art and outdoor activity worlds together with a concentration on my first love: The Northeast. Please feel free to contact me with any questions or custom orders! Kerry is an avid hiker, rock-climber and skiier. 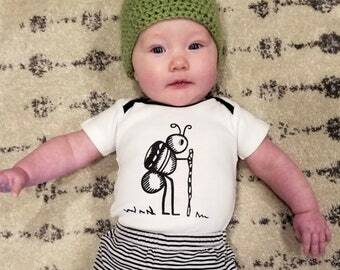 She is also the creator of Sherpa Ant and loves illustrating and merging her love for the outdoors with her art. Debbie, Kerry's mom, is a shipper extraordinaire and helps run the shop while Kerry is off on her thru-hikes. 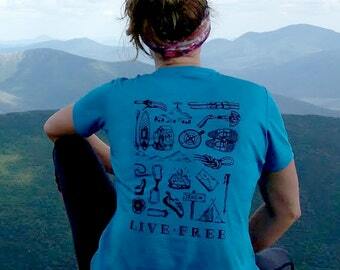 She is currently working on her 4,000 footer list in NH and is more than halfway through! Prints large maps and posters. Screen prints my original, hand-drawn design. There are a few ways to frame the "Color your trail hiking map" so you do not have to remove the map from the glass every time you would like to color. 1. You can take your map to a professional framer and for about $35 they can mount the poster to foam board. This allows you to put your map in a frame without the glass. 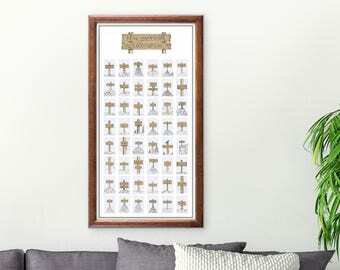 If you are crafty, you can mount the poster yourself by purchasing mounting spray from your local craft store. 2. You can use white board markers over the glass to color the trails. Then you can erase and start fresh every season, year or simply to change the color! Want a different background color or your names personalized on your map? Message me with your request and I can send you a quote for your idea! Adding custom options or color to your map will take approx. 2 - 3 weeks to receive.